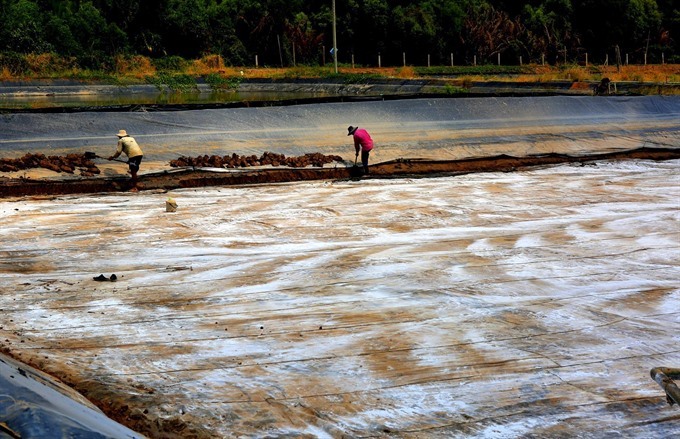 CẦN THƠ — Developing flood-based agriculture models, ditching intensive shrimp farming for integrated farming could be key for the Mekong Delta to cope with the threat of climate change. These livelihood solutions for the region, predicted to be among worst hit by climate change and rising sea levels, were presented by Andrew Wyatt, Mekong Delta programme manager, from the International Union for Conservation of Nature and Natural Resources (IUCN), at a conference held by Green Mekong to review its past working year. Green Mekong was an initiative by the HCM City-based Tuổi trẻ (Youth) newspaper, launched shortly after the Government adopted a milestone document on sustainable development for the Mekong Delta in late 2017, to review climate-resilient economic models in the Mekong Delta provinces as well as the implementation progress of the Government’s Resolution. The Mekong Delta is facing a series of challenges, as unsustainable land use and poor management of underground water and alluvium has actually worsened the rate of the sinking, posing even greater risks than rising sea level, while weak planning of sea zones and thinning mangroves leave coastal areas exposed to disastrous consequences from strong typhoons and rising sea level, Wyatt from IUCN told the conference held last Thursday. He advised against intensive farming near the coastal zones and switching to integrated shrimp-mangroves model, eliminating the need to draw up underground water, an activity that was proved to accelerate the sinking rate of the delta as sea level rises. “The key issue here is that there needs to be a mindset change, from people, governments and businesses in the Mekong Delta,” Lê Minh Hoan, Party Secretary of the Đồng Tháp Province. Farmers need to abandon the practice of three rice crops a year, as building up dikes to retain water in the paddy fields would prevent the already declining alluvium from entering the fields at all. “If the rice’s growth depends solely on the fertilisers, their quality and taste would suffer, the farmers would also suffer as production costs rise,” Hoan said, warning careless pursuit of more output would backfire. He suggested that there is an urgent need to switch to other integrated models, such as rice-fish, rice-lotus, or rice-shrimp farming. Lương Minh Quyết, director of Sóc Trăng Province’s agriculture department, proposed the establishment of a Mekong Delta committee, chaired by the HCM City Party Secretary. The committee would have 130 members, who are capable scientists and engineers that would advise the chair on matters related to Mekong Delta connectivity and development. From January to July this year, Green Mekong has reviewed the performance of nearly 30 agricultural production models in the Mekong region with 13 of the best models selected to receive financial support. Notable models include switching low-yielding paddy fields in Ba Tri, a coastal district of Bến Tre Province, to cattle grass; a wind power farm in Bạc Liêu Province; a model in the upstream regions of Kiên Giang seeks to teach farmers to replace third rice crop with lotus and know-how to grow bananas in tandem with growing vegetables and breeding fish.